The global facial recognition market was valued at US$ 1,307.0 Mn in 2014 and is expected to grow at a CAGR of 9.5% from 2015 to 2022. Currently, the market is primarily driven by robust technological advancements for development of efficient surveillance systems required by civil and government agencies. This is due to rising instances of criminal and terrorist activities and identification of fraud cases across the globe. Moreover, facial recognition systems that can scan images in all environmental conditions are being developed using 3D facial recognition technology. This would help overcome the barriers of 2D facial recognition technology that include light and pose deflections of the object. However, restrictions on users to share their personal details i.e. covert monitoring of an individual, is expected to hinder the market growth. Furthermore, increased adoption of facial recognition in web applications for picture tagging, social interaction, and others is expected to drive the demand for facial recognition in future. The global facial recognition market is analyzed on the basis of parameters such as type of technology, end-use industry and geographic regions. Of the different technology types, the 2D facial recognition technology segment contributed a significant revenue share in the global market in 2014. This is due to the adoption and acceptance of 2D facial recognition technology in surveillance, which is primarily due to its low cost and easy installation using existing cameras. The market for 3D facial recognition technology, that offers better and accurate results, is expected to record steady growth as compared to 2D technology. Furthermore, the facial recognition market is witnessing development of facial analytics systems that help generate descriptive metadata about a given face, apart from simple identification. This has resulted in the use of facial recognition technique as both identification and authentication tools. Facial recognition technology, primarily used for human face detection and identification helps in better surveillance at a particular location where strict people movement monitoring is required. Thus, this technology has wide acceptance across industry verticals namely government and utilities, military, homeland security, banking, financial services, and insurance (BFSI), retail, and others. In 2014, the government and utilities segment recorded the highest market revenue share as compared to other end-use industries. This is due to the growing security threats at government organizations and departments coupled with the demand for better authentication systems to minimize crimes related to identification (ID) frauds. Apart from its wide use in border control, facial recognition is extensively used for law enforcement in order to covertly monitor people. However, in future, facial recognition is expected to be used as authentication method in various handheld devices such as laptops, computers, and smart phones. Furthermore, retail industry is expected to witness rapid adoption of facial recognition in terms of security as well as surveillance to monitor customer behavior. 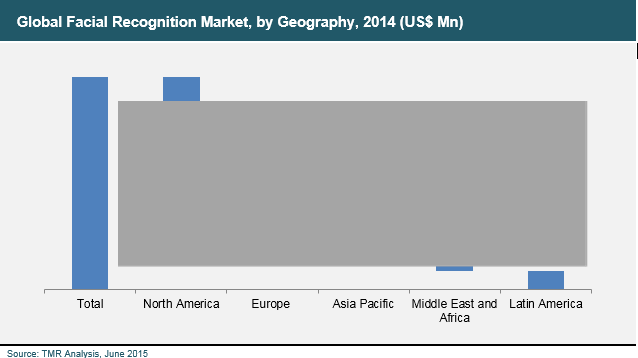 Geographically, North America dominated the global facial recognition market in 2014 and accounted for around 38% share of the total market in the same year. Further, the Asia-Pacific region with major markets such as Australia, Japan, South Korea, India, China, Malaysia, and Singapore, is expected to record steady growth as compared to other regions in later years of the forecast period. Other countries such as Mexico, Brazil, and few of the Middle Eastern countries are expected to witness wide adoption of facial recognition technology. The facial recognition market is dominated by players such NEC Corporation, Safran Group, Cognitec Systems, Aware Inc., Cross Match Technologies Inc., 3M Cogent Inc., Animetrics, Inc., Ayonix, Inc., FaceFirst Inc. (Airborne Biometrics Group Inc.), ZK Software, and Aurora Computer Services Ltd. Of these, NEC Corporation, Cognitec Systems, and Safran Group (Morpho S.A.) held a significant revenue share in the global facial recognition market. This research report provides analytical insights on the ‘global facial recognition market’. The market overview section of the report emphasizes on the market dynamics and trends, which include the drivers, restraints, and opportunities that influence the current nature and future growth of the market. The market estimates have been analyzed by keeping in mind the several factors, which affect the market including but not limited to technological, economic, social, environmental, and legal factors. Facial recognition is a biometric technology used for the identification and authentication of people by capturing facial images using a camera and then comparing the captured images with an existing database. These systems perform identification of facial images on the basis of various facial features, such as distance between eyes, cheek bones, eye-brows, and others. Facial recognition technology is preferred over other biometric techniques such as iris, fingerprint, and voice recognition as it does not require physical contact with the apparatus and is, thus, non-intrusive. Moreover, the facial recognition technology is easily deployable using existing cameras and monitoring devices. However, the facial recognition systems face criticism due to privacy issues, such as data cloning and misuse of personal information. Technological advancements paved way for the introduction of efficient surveillance systems to monitor rising crime, frauds, and terrorist activities which, in turn, resulted in the rise in demand for facial recognition solutions. These applications include access control, intruder identification, and detection of gender, age, and ethnicity, among others. The global facial recognition market is segmented on the basis of the type of technology into 2D facial recognition technology, 3D facial recognition technology, and facial analytics. The 2D technology deals with face recognition of an image based on its two-dimensional appearance. It is a widely used technology and has low cost of installation and operation compared to 3D technology. However, 2D technology fails in its operation if the facial image to be identified varies in light conditions, position, and facial expressions. 3D technology overcomes the drawbacks of 2D technology by analyzing a facial image in a three-dimensional view. With the use of 3D technology, various drawbacks such as varying angles and environmental conditions can be overcome, which results in ensuring more accurate recognition of facial images. The 3D technology includes use of complex algorithms and High-Definition (HD) technology. Thus, with the growing technological advancements, the 3D facial recognition technology is expected to witness much faster adoption compared to the 2D facial recognition technology in the near future. Moreover, facial analytics is another emerging technology that deals exclusively with facial expressions. This technology is used for determining different attributes such as age, gender, and other facial characteristics. This technology is majorly used in the retail industry for better marketing of products, and is being increasingly used by the police for identification of criminals based on their changing facial expressions. All these product types find wide applications in sectors such as government and utilities, military, homeland security, retail, banking, financial services, insurance (BFSI), and others (digital signage, web, and mobile applications). Facial recognition systems are majorly used in the government sector and law enforcement agencies for security purposes. Furthermore, due to the rise in frauds in the BFSI sector, facial recognition systems are being increasingly used in this sector to ensure security and reduce crimes. Additionally, facial analytics systems are used in the retail industry to determine the age, gender, and facial expressions of the customers in order to target them for marketing suitable products of the concerned company. In terms of geographical distribution, the global facial recognition market has been classified into regions such as North America, Europe, Asia-Pacific, Middle East and Africa (MEA) and Latin America. Major players have been profiled with focus on their competitive details such as company and financial overview, business strategies, and their recent developments. These players are focused on developing efficient technologies that will ensure better surveillance or monitoring of people. Some of the market participants profiled in this report include NEC Corporation, Morpho S.A.S. (Safran Group), Cognitec Systems Pty Ltd, Aware, Inc., Animetrics, Inc., Ayonix, Inc., Cross Match Technologies, Inc., 3M Cogent Inc., FaceFirst, Inc. (Airborne Biometrics Group Inc.), ZK Software, Inc., and Aurora Computer Services Ltd., among others. The report analyzes the global facial recognition market in terms of revenue (US$ Mn) for each segment for the period from 2012 to 2022, along with the CAGR for the forecast period from 2015 to 2022.